﻿ Best Bitrate Converter - Change Bitrate of MP4, MOV, MKV, MP3 etc. Bitrate Converter: How to Convert Bitrate for MP4, MKV, WMV, MP3, AAC etc. Bitrate, also known as transfer/data rate, describes the rate at which bits are transferred from one location to another. In other words, it measures how much data is transmitted in a given amount of time. Bitrate is commonly measured in bits per second (bps), kilobits per second (Kbps), or megabits per second (Mbps). It matters a lot on video and audio quality. High bitrate means better quality. For example, a MP3 audio file that is compressed at 192Kbps will have a greater dynamic range and may sound slightly more clear than the same audio file compressed at 128 Kbps. Similarly, a 3000Kbps compressed video files will look better than the same file compressed at 1000 Kbps. Just like the quality of an image is measured in resolution, the quality of an audio or video file is measured by the bitrate. But high bitrate means larger size as well. If you wanna save more space on your device, you need a bitrate converter to change bitrate of MP4, MOV, MKV, MP3 etc., from high to low with little effect on files' quality. To get a better MP3, MKV, MOV, MP4 video bitrate setting, the seeking of the best bitrate converter never stops. But awashed with so many free MP4 MP3 bitrate changers on the market, you may found some of them are only available to audio or video adjustment rather than both, some only supports to change bitrate on Windows platform instead of Mac. So is there a more powerful audio and video quality modifier for bitrate adjusting, running both on Windows and Mac? Surely, there is. MacX Video Converter Pro is exactly the right one, allowing you to adjust video bitrate in the process of conversion, and change MP3 bitrate extracted from videos as well. Moreover, being an excellent video converter for Mac and Window, it's not only capable of adjusting bitrate, changing video resolution, frame rate, codec, aspect ratio etc., but also transcoding HD SD videos, like MKV to AVI, AVI to MP4, YouTube to MP3 etc. And it is known for its enhancement of video quality as well, for example, on iPhone 7 after adjusting video parameters to h.264 codec, 2500kbps, 640x480 res, 23.97fps, 16:9 aspect ratio. Before you start to convert bitrate for MP4, MOV, MKV, MP3, AAC, firstly you need to free download the bitrate changer on Windows, or check the Mac version bitrate converter if you'd like to convert bitrate on Mac. Then here we go for adjusting video bitrate. Step 1: Click "+ Video" button or simply drag-n-drop to load your video. You're empowered to load several for batch converting. Step 2: Choose the output format as you need. Usually MP4 is suggested for its wide compatibility on a range of devices. And if you'd like to extract audio from video and change MP3 bitrate, you can choose "to Music" > "MP3" as output. Step 3: Click the gear icon on the main interface and get ready to change video bitrate. Here are video and audio sections for bitrate adjustment as well as changing aspect ratio, resolution, frame rate etc. Just go to bitrate from the drop-down window and simply choose target bitrate. Sometimes the video bit rate option may be unable to change since it's Constant Bit Rate. Step 4: Click "Browse" button to specify the output folder and then hit "RUN" button to convert bitrate for MP4, MOV, MKV, MP3 etc. Before you start converting bitrate, you can change video resolution, adjust video frame rate, set aspect ratio etc. on the parameter setting panel. And to reach a negligible quality loss of the video, you'd better set your video bitrate matched with frame rate, resolution, aspect ratio etc with the video quality converter. For example, a 2500Kbps bitrate should go hand in hand with 640x480 res, 23.97fps, 16:9 aspect ratio for your iPhone 7. One option you will notice when you go to encode your videos is a selection for VBR (Variable Bit Rate) or CBR (Constant Bit Rate). As a general rule VBR is for progressive or standard downloads and CBR is for use when using a streaming cloudfront. VBR, just as its name implies, allows you to set a maximum and minimum bitrate. This helps to give you a smaller overall file size, but the unpredictable spikes in bitrate can choke the playback of streaming videos. CBR is used when a predictable flat bit rate is needed. The flat bitrate throughout the entire file comes at the price of efficiency for the codec. Usually resulting in a larger file, but smoother playback. However these rules are not universal. Depending on your video you might want to use a VBR for a streaming playback if the spikes do not exceed your target user's connection speed. For example if there is only one high motion scene in a video, you will be wasting bandwidth on a constant bitrate throughout the entire file and may better serve your user's by using a variable bitrate. So CBR or VBR, it depends on the specific cases. But for the discussion of bitrate converter, the matter is that only your video is in VBR, can you change video bitrate. As you decide to change video bitrate for saving more space on your device, you may be stuck in which bitrate is best fit your video indeed. Actually there is no exact best number for bitrate, it should be matched with video resolution, codec, frame rate etc. But to get a better understanding of them, here we take YouTube video bitrate as an example. 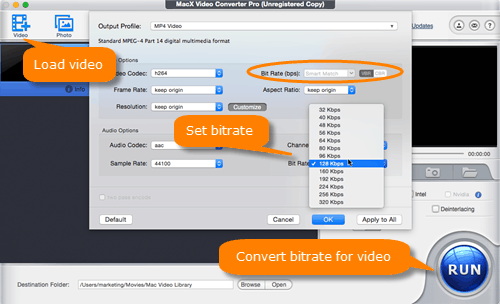 Free download the best bitrate converter - MacX Video Converter Pro to convert bitrate for MP4, MOV, MKV, MP3, AAC etc. for saving more space on your iPhone Xs Max/Xs/XR/X/8/7/6s/Plus, iPad, Android, Mac/Windows PC, Apple TV etc. Frame Rate Converter - Change Frame Rate 23.97, 29.97, 30fps.